Customers are gravitating towards a one-on-one relationship with brands, and email provides a unique opportunity to deliver on that expectation with relative ease. 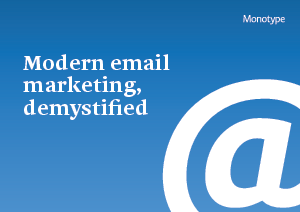 Email marketing isn’t about sending “blasts” anymore. It’s closer to writing a letter, where the content is chosen based on what the customer wants, not what you want. Using web fonts allows brands to unlock the potential of email with responsive, customized messages delivered directly to opted-in consumers. Using web fonts also opens up possibilities for greater automation and efficiency around the email process. Sounds great, right? But how do you make it all happen? Download this eBook to find out!